SEOUL, Oct. 30 (Yonhap) — There was a rare battle of submarine pitchers in South Korean postseason baseball on Tuesday, and one right-hander triumphed over the other to extend his team’s playoff life. 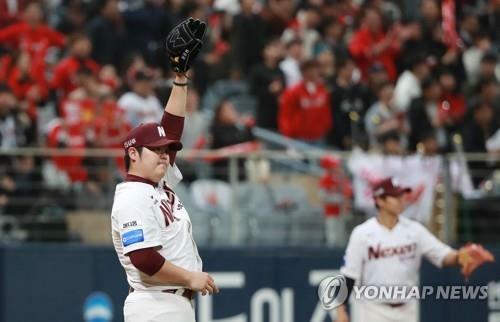 The Nexen Heroes got past the SK Wyverns 3-2 in Game 3 of the second round in the Korea Baseball Organization (KBO) playoffs, avoiding elimination after dropping the first two games in the best-of-five series. 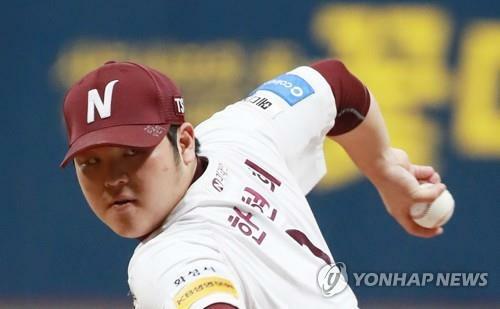 And Nexen’s Han Hyun-hee became the first starter to be credited with a win in this series, after holding the Wyverns to two runs on six hits in 5 1/3 innings. Those two runs came from two solo homers. Han’s counterpart, Park Jong-hoon, was the losing pitcher. He was charged with three earned runs on six hits in 4 1/3 innings. Han attacked the zone from start to finish, and threw 60 of his 88 pitches for strikes. He didn’t give up a walk and struck out seven. And he got plenty of help, both from his offense and bullpen, to earn his third career postseason victory, and first in a start. Han worked a quick first inning, but Jamie Romak led off the second inning with a solo shot to right field. Han gave up a single two batters later, but sat down the next two batters to limit the damage. Han then found his groove, retiring the next eight batters. He struck out the side in the fourth, including Romak on a slider at 2-2 count. That streak came to an abrupt end when Han gave up his second home run of the day, with Kang Seung-ho taking him over the left field wall. That tied the score at 2-2. And Han dodged a bullet when the next batter, Park Seung-wook, hit a fly ball off the top of the left field fence and was thrown out at third base trying to make a triple out of it. The Heroes backed Han with a go-ahead run in the bottom fifth, when Song Sung-mun delivered a sacrifice fly. Han almost frittered away the lead in the top sixth. He gave up a leadoff double, and after getting one, allowed a single and hit a batter to load the bases. That spelled the end of Han’s day, and left-hander Oh Ju-won was called in to face left-handed batter Park Jung-kwon. The Wyverns lifted Park for right-handed pinch hitter Jung Eui-yoon. At 1-2 count, Jung grounded into a 5-4-3 double play, killing the rally and getting Han off the hook at once. After Oh, three more relievers shut down the Wyverns over the final three innings, while striking out six. Right-hander Lee Bo-geun was outstanding in striking out the side in the eighth with a man at second base. But the night belonged to Han, who was named the Player of the Game. Han also got a measure of personal redemption because he had a couple of mediocre postseason outings before Tuesday. He was charged with a run without recording an out in the wild card game against the Kia Tigers on Oct. 16. He made a start against the Hanwha Eagles in the first round four days later, and gave up four runs on four hits in three innings, while walking four batters and hitting two others. In the pre-series media day last Friday, Nexen manager Jang Jung-suk said he still had much faith in Han and added the right-hander was due for a fine outing. And Han came through when the team needed him most. Han said the key to his victory was holding SK slugger Han Dong-min in check. To say Han Dong-min had the right-hander’s number in the regular season is an understatement: the left-handed hitter was 7-for-14 with four home runs against Han Hyun-hee. But on Tuesday, he was 0-for-3 with a strikeout against the pitcher. Han thanked his bullpen for preserving his victory and said he’s ready to join the crew in the pen whenever the team needs him.